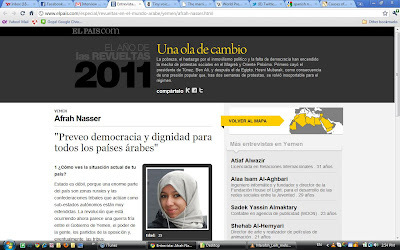 I was interviewed by one of the widest selling Spanish newspaper, El PAÍS ; discussing the uprisings in Arab countries, youth's role and the use of social media in the protests. Here is the English version of the interview. 1 How do you see the current situation in Yemen? The situation is multi-layered and politics in Yemen is sort of complicated. State control is weak; since a huge part of Yemen is rural areas and tribal confederations acting as autonomous sub-states are very prevalent. The revolution taking place now feels like a cold war between the Yemeni government, people’s power, opposition parties and eventually with the tribes. 2 What are the main problems of young people? It’s all about economical problems. Nearly an average Yemeni lives on less than 2 dollars per a day and Yemen has an increasing unemployment crisis. That’s an alarming indicator of the bleak future waiting for the half of the population who are below the age of 18 when no jobs are waiting for them. 3 Are you following the news about the protests in other countries? What do you think about them? Of course I follow the news around the region. Actually, I was over-joyed by the Tunisian revolution and I was over-joyed too by the Egyptian revolution. I think all Arabs countries; ruled by dictators must follow the Tunisians and the Egyptians. Yemen is following their steps; it’s just a matter of time. 4 Do you think that protests will become stronger in Yemen? What do people say on the streets? Yes. I think protests will increase more and more each day. Yemenis on the ground have so much faith in their revolution and I’m amazed by people’s power and unity to obtain freedom and dignity. 5 What's the role of the social networks in the protests? Do you know, for instance, any Facebook group against your country's government other than yours? The role of social media has been greatly important on all of this. There are tens of Facebook pages created every day/week to support a certain cause of the protests such as pages for Human Rights Watch or Humanitarian Relief for victims, etc. In addition, pro-president Facebook pages are also being created! 6 How are your feelings about the future in the North African and Middle East region? Will democracy arrive soon? I feel excited for the new era the region is entering. I feel the future is going to be very bright. I know that it will take a great deal of time to get things in a relative order but I’m still optimistic about what’s coming. 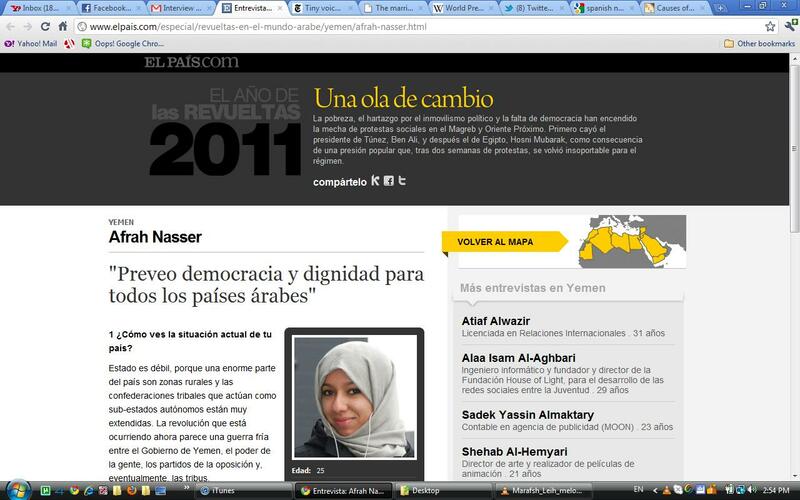 I foresee democracy and dignity for all Arab countries and most importantly to my beloved country, Yemen. I can’t stress enough on how happy I’m to be alive to witness this new era and witness these wonderful revolutions.